Halo Vintage Round Diamond Engagement Ring with Pave Setting | Shane Co.
Eighty round sparkling diamonds, at approximately .45 carat total weight are pavé-set in this brilliant split shank halo design crafted from quality 14 karat white gold. This vintage inspired design features milgrain and intricate side engraving. 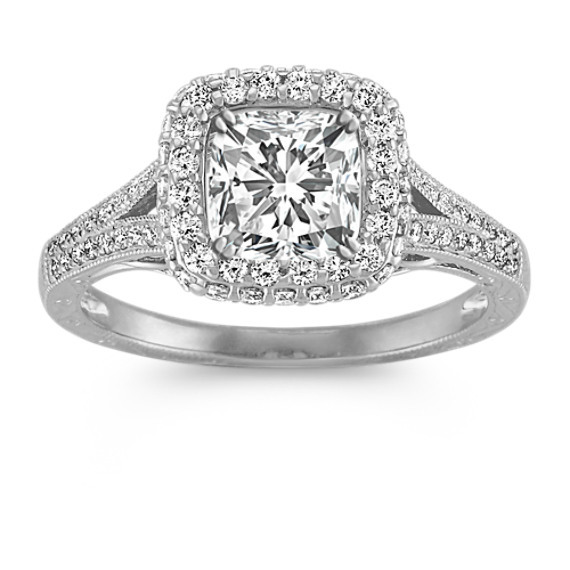 The center stone of your choice at approximately 1.00 carat will look stunning. My then boyfriend and I went into the store just to get an idea of some styles that I liked and we found this treasure! I was immediately drawn to this ring and that was it I knew it was the one for me!! I tell everyone that it really did "find" me when I least expected it. About 5 months of dreaming about this ring, he surprised me with it and I haven't stopped staring at my hand since. The detail is incredible and I have gotten many compliments on its "antique" look. If you are a fan of the Halo setting and you love a very dainty antique look, you must look at this ring! I also highly recommend the round center diamond, it really stands out! The pictures on the website do not do this ring justice. I fell in love with this ring in store after looking at some of the other rings I used to have saved on my wish list that did not even compare to this ring. It looks so much bigger online than it really is. It's so detailed and just beautiful.